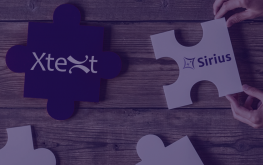 White Paper Xtext/Sirius: How to get the best of these two technologies? You are going to create a domain-specific modeling tool and you wonder how users will edit and visualize the models: textually with a dedicated syntax and a rich textual editor? or graphically with diagrams drawn with a palette and smart tools? Written by TypeFox & Obeo, this white paper explains the benefits of each approach. Then, it presents Eclipse Xtext and Eclipse Sirius, two open-source frameworks for the development of textual and graphical model editors. And finally, find out two detailed use-cases where these two technologies can be integrated in the same modeling workbench. This subject was presented at EclipseCon Europe & SiriusCon this year! Find out the slides of this presentation and have a look at the video recording.